Натисніть на фотографію і подивіться всі доступні фотографії до Hotel Dei Platani. Air/conditioned room with balcony and satellite TV. 2 Задасте дату а виявите наявність, зобразяться а й ціни готелів на даний час. Air/conditioned room with balcony and satellite TV. Wi-Fi is free. 3 Задасте дату а виявите наявність, зобразяться а й ціни готелів на даний час. Air/conditioned room with balcony and satellite TV. Wi-Fi is free. 4 Задасте дату а виявите наявність, зобразяться а й ціни готелів на даний час. Hotel Dei Platani has recently been made into an environmentally-friendly hotel and offers free Wi-Fi and luxurious facilities in a quiet area of Rimini Miramare, just 90 metres from the beach. Enjoy complete relaxation at the wellness centre, where you can try a sauna with musicotherapy, hot tubs and sunbeds as well as a variety of massage treatments. Gym facilities are also available and bikes can be hired from Hotel Dei Platani. Entertainment for adults and children is organised on the well-equipped beach and kids will also find their own playground here. Inside there is a TV lounge and Hotel Dei Platani offers special rates on some excursions. 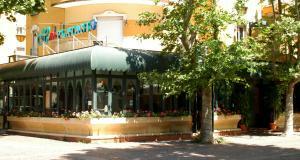 The restaurant serves typical local dishes and kitchen facilities are also available for mothers and children. Please note that for bookings of more that 7 nights, the hotel could require a security deposit.